Researchers at Yokohama National University and the University of Tokyo in Japan have created an ion gel with exceptional toughness and the ability to self-heal at ambient temperatures without any external stimuli such as temperature or light. Ion gels have gained a lot of attention because of their unique properties such as high thermal stability, low tendency to evaporate at room temperature, and a high ionic conductivity.The team demonstrated an ion gel with the capability to rapidly heal on its own without any external stimuli at room temperature. They also showcased the material’s outstanding toughness resulting from many hydrogen bonds within the material. The study, reported in Advanced Materials in July 2018, illustrates a particular type of polymer gel, called the ion gel that is filled with salts in liquid form, or ionic liquids. This ion gel was developed by integrating two materials, or « blocks »— one is repelled by ionic liquids while the other bonds with hydrogen. Collectively, they form what is known as a diblock copolymer. The combination of the liquid salts and the diblock copolymer material led to a final micellar structure that is responsible for all of the material’s favorable qualities. The block that is repelled by ionic liquids forms the core, while the outer side is made up of chains that interact with one another via numerous hydrogen bonds. The research is the first demonstration that the introduction of hydrogen bonding into ion gels can lead to the material’s strength as well as its capacity to self-heal at room temperature. « The self-healing process of this ion gel can be completed as quickly as within a few hours, » Tamate said. « Hydrogen bonding is reversible, and as a result, it is a promising interaction that contributes to a material’s ability to self-heal due to their reversible nature. 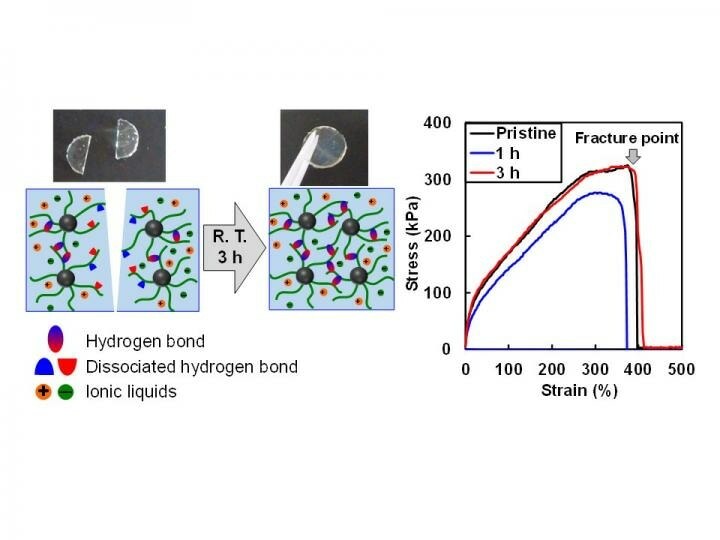 In this study, by tuning the hydrogen bonding strength of polymer chains in ionic liquids, we utilized hydrogen bonding as a reversible cross-linking point of the ion gel. Furthermore, we proved that the micellar structure formed by the diblock copolymer material significantly improved the physical strength and self-standing ability of the ion gel, » he added. Although several types of tough ion gels have been created so far, the researchers state that accomplishing both self-healing ability as well as high toughness remains a huge challenge. They also report that their gel’s electrochemical and mechanical properties were like those of an otherwise unchanged or unaltered ion gel. The material’s self-standing feature, the fact that it can self-heal at room temperature as well as easily processed in solution all make it a favorable solid electrolyte for future applications in the domain of flexible electronics—specifically to develop self-healing electronics. In due course, the researchers would like to create new functional ion gels that can be used to build new devices that are flexible and thereby wearable.